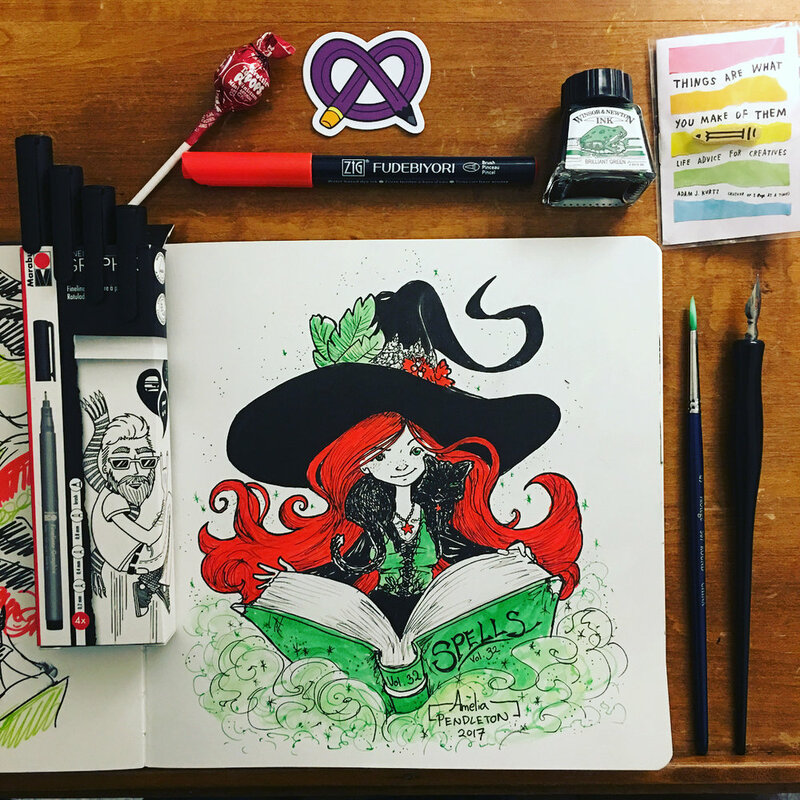 October 2017 — ArtSnacks - The Best Monthly Art Supply Subscription Box. Things Are What You Make of Them Pencil Pin and Mini Zine by Adam J.K.
With the release of his new book, Things Are What You Make of Them, we’ve partnered with artist/author Adam J.K. to bring you an enamel pencil pin created just for ArtSnackers! Filled with “insights and inspiration for anyone who makes art,” J.K.’s book will help you overcome creative fears and find your purpose. Flip through the mini zine for a preview, and wear your pencil pin proudly! This handy set of Marabu Fineliner Graphix Pens covers all your drawing needs. In this pack, you’ll find fine liners in sizes 0.2mm, 0.4mm, and 0.8mm, as well as a brush tip pen! They’re each filled with water-based pigment ink that flows consistently and smoothly. Big things can come in small packages! A favorite of illustrators since the 1890s, Winsor & Newton Drawing Ink features brilliant, dye-based color that’s great for precise line work or looser application. You can easily layer your new pens on top since the ink is fast-drying and water-resistant when dry. Each iconic bottle features a whimsical illustration based on the ink color – which one did you get? A bottle of ink wouldn’t be complete without a reliable dip pen. That’s why we’ve included a Speedball Standard Pen Nib Holder and No. 512 Pen Nib for you to try out your new ink. This nib has a fine, semi-flexible tip that’s perfect for drawing or lettering. To use, insert the nib into the circular opening on the top of the nib holder. Be sure to wash your nib with warm water after every use! For a different inking experience, use the Connoisseur Protégé Short Handle White Nylon Brush with your Winsor & Newton Drawing Ink. This sturdy brush has durable bristles that can handle a full paint (or ink!) load for long-lasting strokes of color. The ZIG Fudebiyori Brush Pen packs a punch of color! Filled with dye-based ink, this pen can create a variety of vibrant lines. Its firm felt tip provides great control, making it perfect for adding finishing touches and details to your work.